Chopsticks, written by the great Chopin to his son in Russia has become wildly popular. Knows if not every dog, or at least every citizen who once went to music school. However, to learn to play the piano with chopsticks, do not need any special musical ability. You just know the notes. But to learn it, you will definitely be remembered for among friends the able pianist. 2. the initial level of musical literacy. Sit down at the piano. You must be convenient - both hands rest on the keyboard, feet are under the pedals. Inspect the keyboard, find the first and second octaves. Mentally scroll in my head the melody. Chopsticks consist of two sentences - question and answer. Each proposal in turn, consists of three phrases. Chopsticks is played mostly on the black keys. Please note that this is a waltz, so it was written in 3/4 size. Learn the first sentence. First phrase: re-sharp of the second octave, C sharp second octave f sharp of the first octave, twice the f-sharp of the second octave. The second phrase is an exact repetition of the first phrase. The third phrase: d-sharp of the second octave, C sharp second octave f sharp of the first octave, the f-sharp of the second octave, d-sharp first octave f sharp of the second octave, C-sharp first octave, twice FA of the second octave. Play several times. Learn the second sentence. First phrase: re-sharp of the second octave, C sharp of the second octave, C-sharp first octave, twice FA of the second octave. The second phrase is an exact repetition of the first phrase. The third phrase: d-sharp of the second octave, C sharp of the second octave, C-sharp first octave ... second octave do, re-sharp of the first octave ... second octave f sharp of the first octave, twice the f-sharp of the second octave. Play several times. Practice at different tempos. You can play one or two hands. Imagine you dancing to this music. This is necessary in order to feel waltz size. If your hands move along the keyboard freely and easily, you can demonstrate your skills to friends. Chopsticks is played with a touch of "staccato," that is, abruptly. 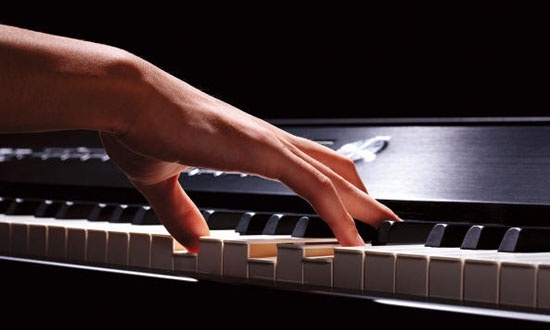 To master this technique, you need to imagine that your fingers are butterfly wings that are easy and elastic touch the keys.